Though white washing has become old fashioned but it has not become obsolete. Nowadays Distempers and Oil paints have taken the place of white wash but it’s still being used in many homes or part of the homes. 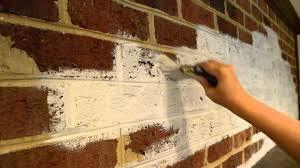 White washing is a process of giving wash of slaked lime prepared with water, to the plastered surface. Some other agents like gum, rice water, common salt, Fevicol etc. are also added to develop desired properties. The base material of white wash is a fat lime or shell lime. Sufficient water is taken in a container and unslaked lime lumps are put in it. The mixture is thoroughly stirred with the help of wooden poles and allowed to get fully slaked for about 24 hours. After 24 hours the solution is screened through a clean coarse cloth. Clean gum is at the rate of about 4 kg for every cubic meter of lime solution. The gum is dissolved in hot water and added to the solution of slaked lime. To obtain pleasing effect, one can also add Copper Sulphate at the rate of 4 kg for every cubic meter of lime solution. Gum, alum, common salt, rice water or Fevicol is added to improve the sticking power of white wash.
Before commencement of white washing the surface to be white washed should be made thoroughly dry. In case if the surface is newly plastered then it should be thoroughly cleaned first to remove mortar droppings and other objectionable matters. If the surface is very smooth then it should be rubbed with sand paper to make it rough for proper adhesion of white wash. In case of re-white washing over old surfaces, all loose scales should be scrapped off with the help of wire brushes. After the surface is cleaned and dried, white washing can be started. 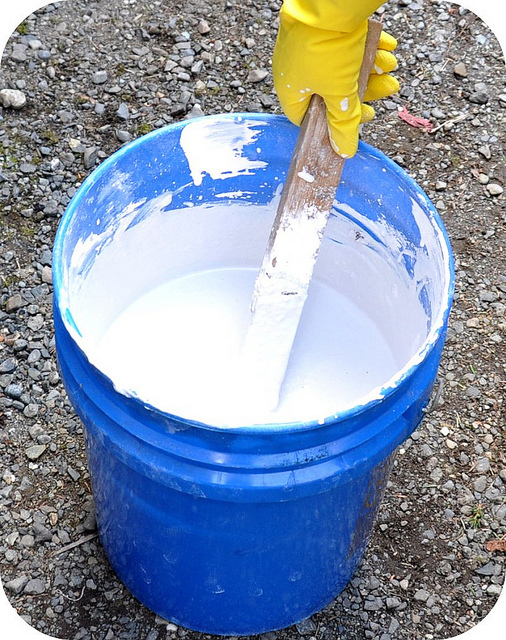 White washing may b done in one coat, two coats or three coats. In case of new surfaces generally three coats of white wash is preferable. For old surfaces one or two coats of white wash is sufficient. In three coats of white washing, the first coat is applied with horizontal stroke of the brush, second coat with vertical stroke and last finishing coat again with horizontal stroke. If only one or two coats of white wash are to be applied, the last coat should always be with horizontal strokes of brush. Finished dry surface of white wash should exhibit very smooth and even surface. It should not stain the hand when rubbed.